Alex White Plume is the former Tribal President of the Oglala Sioux Tribe of South Dakota. 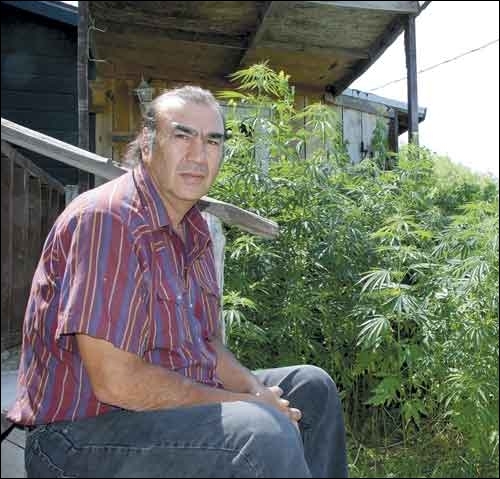 Alex White Plume, from the Oglala Sioux Tribe of South Dakota, is the only farmer to plant, cultivate, produce, sell and deliver a hemp crop within the borders of the USA since 1968. The 1851 Ft. Laramie Treaty recognizes the Lakota as a sovereign nation and grants that the Lakota of the Pine Ridge Reservation can grow any food or fiber crop.He is the first farmer in the United States that planted, cultivated, produced and sold industrial hemp within the borders of the USA. In 2006 he released, The film Standing Silent Nation, a documentary about the White Plumes and their hemp crop. This entry was posted in Make No Bones Shows and tagged Alex White Plume on "Make No Bones About It. ", Hemp, Indigenous, KAOS 89.3 FM, Make No Bones About It, Native American Indian, Raven Redbone. Bookmark the permalink. Blessings to you Raven and all your guest speakers, you hold the energy well!